I recently painted the shutters on my home and chose to use a 2.5” angled Purdy paint brush. Suffice it to say I was extremely impressed with its performance. It was light weight, very well balanced, and held up to an extremely rough painting project. Painting shutters involves a great deal of pushing the paint brush up into the louvers to get full paint coverage. I was concerned that like other paint brushes that the bristles would begin to fall out or get tangled by having to push the brush up into the louvers. 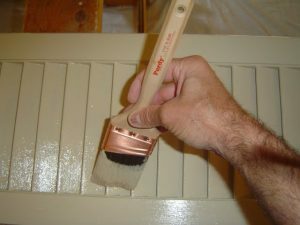 I was pleasantly surprised, however, that the Purdy paint brush held up extremely well, considering the fact that I had to paint 18 old wooden shutters. Not one bristle dislodged from the paint brush handle, and the paint brush maintained its form throughout the entire day of painting. In addition, due to the quality of the paint brush and the fact that I washed it out occasionally with warm water during the day, I will be able to reuse the paint brush on other future painting projects. I was also impressed with how well it held and delivered the paint. I had very few issues with paint drips. This possibly could have been due to my technique of tapping the paint brush on the inside walls of the paint can after dipping the brush tip into the paint. However, it seemed that this paint brush had a tendency to hold the paint onto the brush better than others. In terms of the paint delivery, the Purdy paint brush seemed to release the paint onto the shutters very easily and smoothly. Even after 18 shutters I did not have a sore wrist from painting. The paint seemed to flow from the paint brush with little effort. 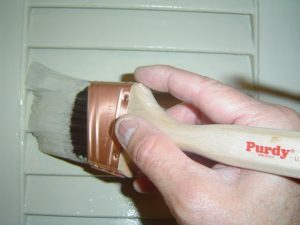 To conclude, I was extremely impressed with the quality and operation of the Purdy paint brush, and though they are a little pricier than other paint brushes, I certainly plan on making a habit of using Purdy paint brushes on future painting projects. See the Installing Interior Window Ebook from HomeAdditionPlus.com. The Installing Interior Window Trim Ebook provides easy to understand, step-by-step instructions, on how to install interior window trim around a window. Pictures are included for every key step in the process.